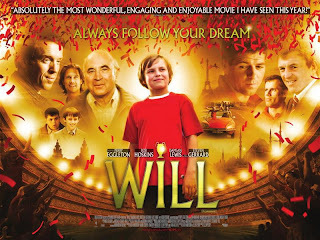 12 year old newcomer Perry Eggleton from Brighton stars alongside Damien Lewis and Bob Hoskins in Ellen Perry's film Will, about an orphan’s journey across Europe to the 2005 Champions League Final in Istanbul. Perry (who attends St Aubyns School in Rottingdean) 's previous acting experience includes appearing in Oliver! in the West End at the end of last year but this is his first film role. Eleven-year-old Will Brennan (Eggelton) is the world's biggest Liverpool football fan. At his boys’ school in southern England, Will’s love and knowledge of the sport is all that sustains him. Then out of nowhere appears Will’s absentee father, Gareth (Lewis), and with two tickets to the biggest match of the year: the Champions League Final in Istanbul. But before the two can begin their journey, Gareth dies suddenly. Determined to make the trip and honour his father's dream, Will runs away. En route, he encounters Alek (Kristian Kiehling), a former Yugoslavian football star who abandoned the game during his country’s civil war. Despite his initial reluctance to help, Alek finds himself inspired by Will’s heroic journey and helps him fulfil his dream. The film also includes cameo performances from Liverpool footballers Steven Gerrard and Jamie Carragher. Filming in the Turkish town of Balat, containing the Ataturk Olympic Stadium scene and a Paris-set scene took place in May and June. The production moves to England and France for further shoots. WILL was scheduled to be released originaly on 18 November 2010, then production moved to 2011 (Day, Month not yet specified) Update until futher notice. After tragically losing both his parents, heartbroken 12 year old Will journeys across Europe to honor his father's wishes to witness the victory of their beloved Liverpool in the Champions League Final. Based on the historic "Miracle of Istanbul," starring Bob Hoskins (Who Framed Roger Rabbit? ), Damian Lewis (Your Highness), and Perry Eggleton, Will is a heartfelt family adventure about the lengths people will go for the love of the game. Subscribe To Get FREE Movie!